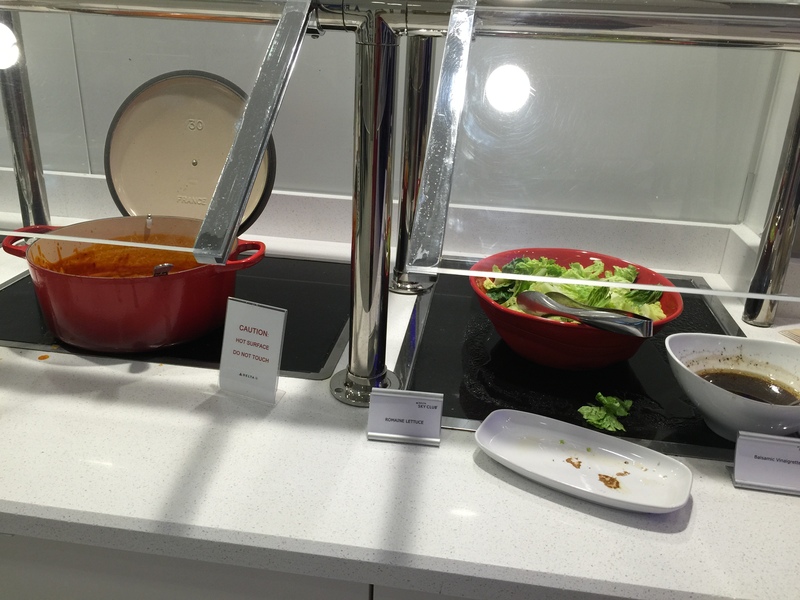 Over the past few years, I’ve had the chance to visit quite a few airport lounges. 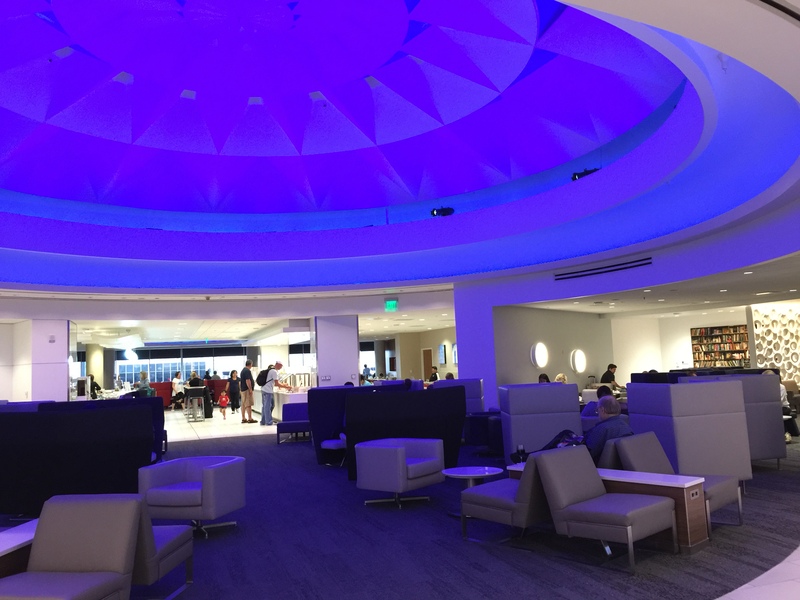 With the exception of just a couple of terrific lounges, the lounges aren’t really anything special. For me, the best part of an airport lounge is just the ability to go somewhere away from the main, crowded, uncomfortable gate area where it seems you can never find a seat. Instead, an airport lounge offers a bit of a reprieve, somewhere you can relax for just a little bit, maybe grab a drink or two, and some snacks, charge up your phone and tablet and just rest until its time to re-join the madness that is the airport. 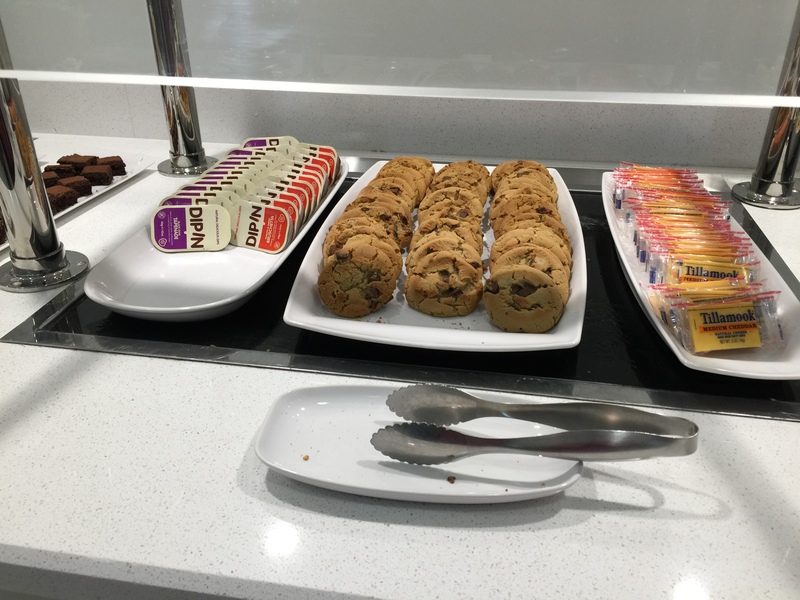 Before a redeye flight to New York’s JFK airport, my husband and I dropped by the Delta SkyClub at LAX. First impression upon walking inside the lounge is that it’s huge! By far, the largest lounge I’ve been to before. There’s seating everywhere, which is a good thing. But, at 9 pm, it was a bit of a shock to find that the lounge itself, as large as it is, probably had 75% of its seats filled. I guess there’s a reason its so large, because it’s apparently extremely popular as well. The front section of the lounge is a quiet, zen-like area filled with loungers and wide comfortable chairs, and even some private small booths all underneath this huge dome-like structure. Off to the side, there were a couple of smaller seating areas which kind of resembled a large study or small library. As you continue to walk through the space, the middle of the lounge is where the food and beverage area is with the food down the right hand side, a sleek, modern bar down the left hand side and a long bar top with stool seating down the middle. 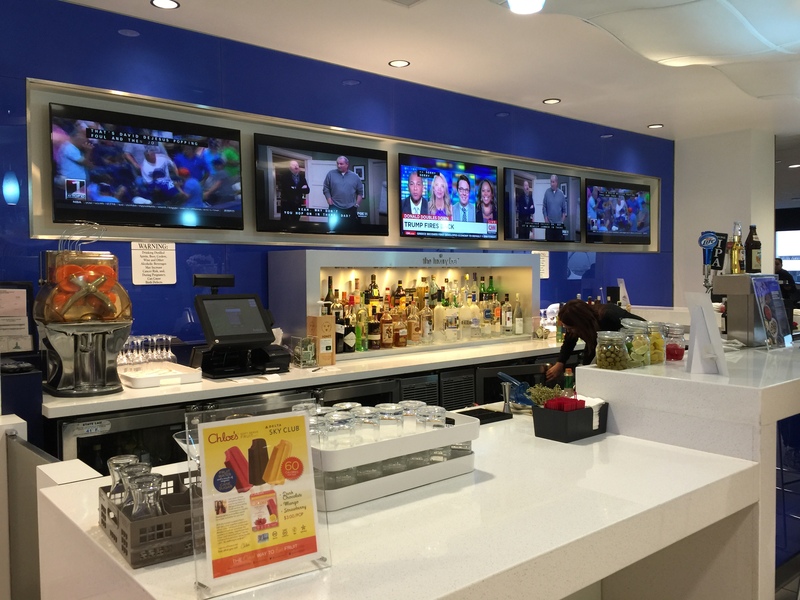 The fully-stocked bar featured 4 television screens, for those who wanted to sit at the bar and relax with their favorite drink on hand. The bartender had access to all sorts of alcohol and non-alcoholic drinks to pour any drink you desired. At the very back of the space is a wall of windows that overlooks the tarmac so you can watch the planes come and go. There’s also work stations along the wall of windows with plenty of outlets for those who want to work while they wait for their flights. And there are also big screen tv’s for those who want to catch up on the daily news or watch a tv show or just relax in front of the television. Let’s get down to the food and drink offerings. 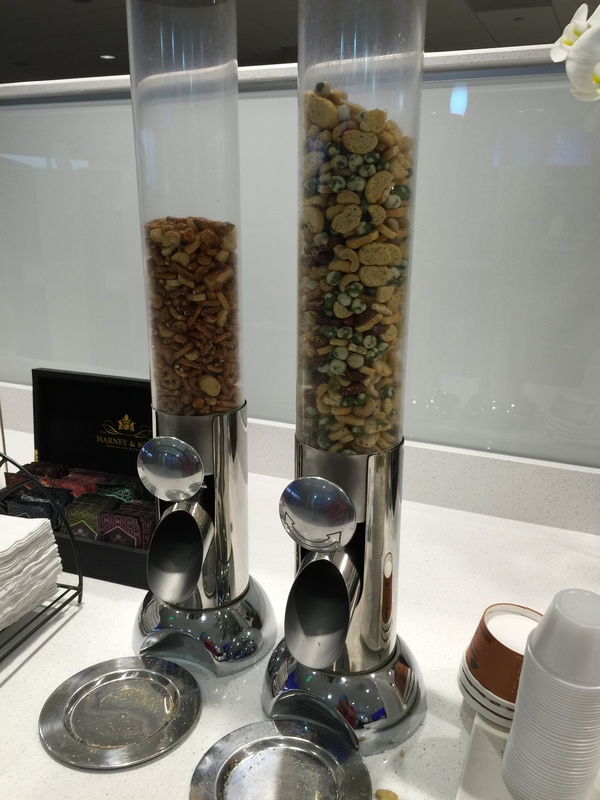 No matter what airport lounge you go to, coffee is always offered. It seems everyone lives on coffee, whether to wake them up or keep them going. 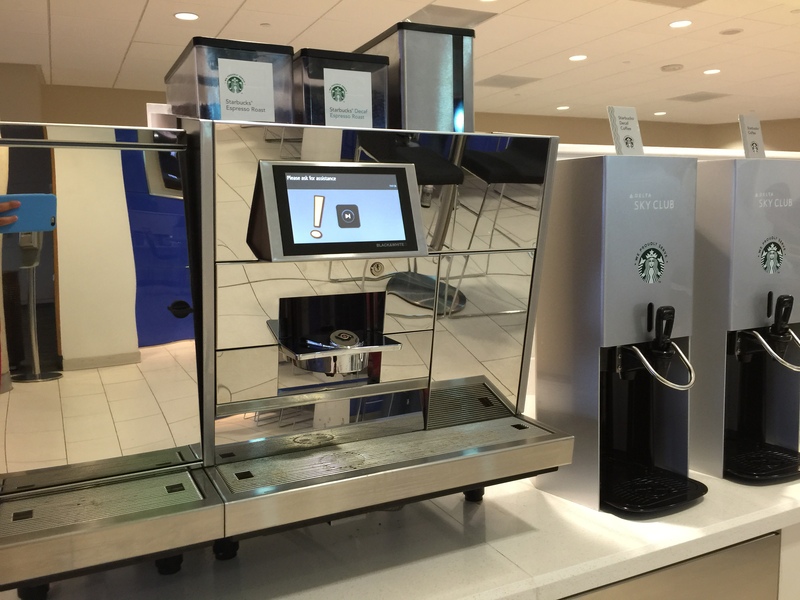 At the Delta SkyClub there was an offering of Starbucks coffee. Brewed coffee that you can pour yourself or a fancy coffee machine that can make different espresso drinks for you – cappuccinos, espressos, lattes, etc. Food offerings were pretty minimal, enough to grab a snack so you’re not hungry. But I certainly wouldn’t call it a meal by any stretch of the imagination. There was salad with some balsamic vinaigrette dressing and hot tomato soup. How about some cheese, crackers, fresh veggies (celery and carrots) and dipping sauce. Interspersed was chocolate chip cookies. These cookies were actually pretty good. 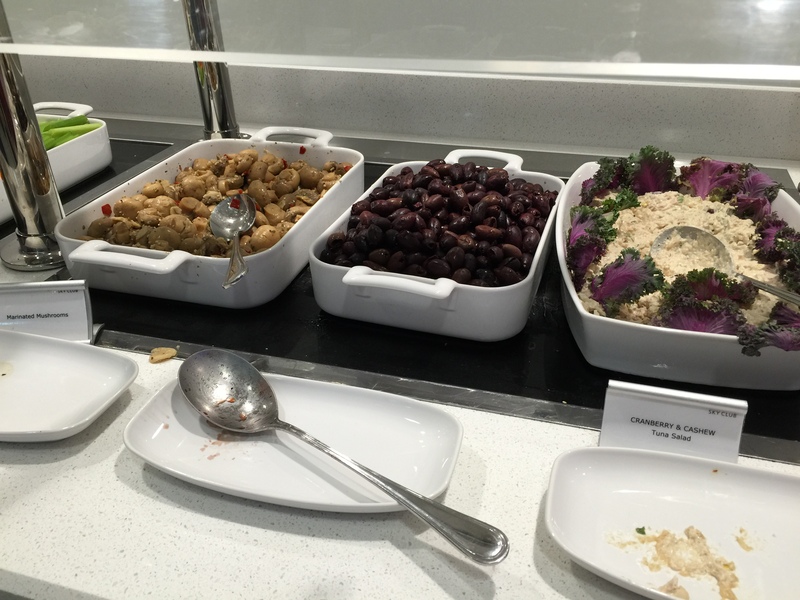 Some lighter, healthier fare in the form of marinated olives, marinated mushrooms and cranberry and cashew tuna salad. Unfortunately, these aren’t items I enjoy at all, so I didn’t partake in any of it. And there were some bar snack, finger food type items. A couple of different offerings of party mix or bar nuts. And now we’ve made it to the real dessert. See, I told you there wasn’t really that much food to speak of. 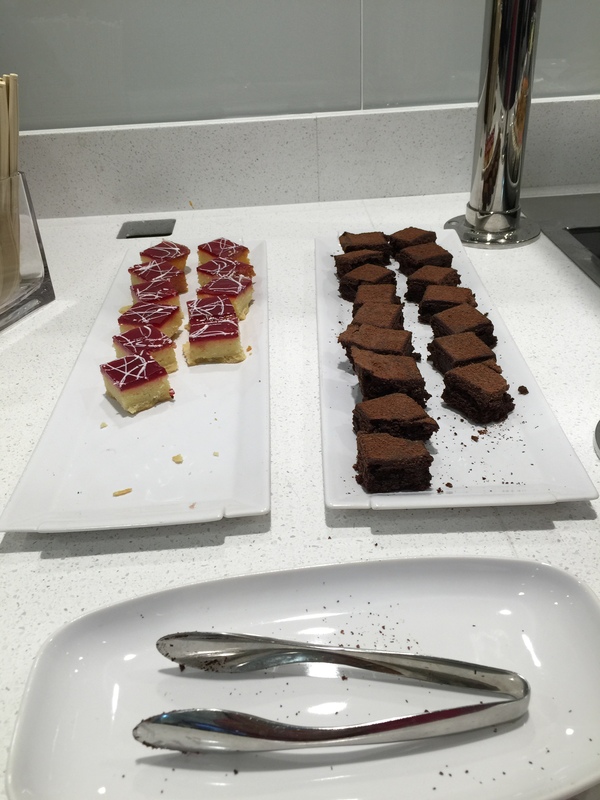 Here we have raspberry cheesecake bites and chocolate brownies. I’ve got to admit that I had quite a few brownies and they were really good. 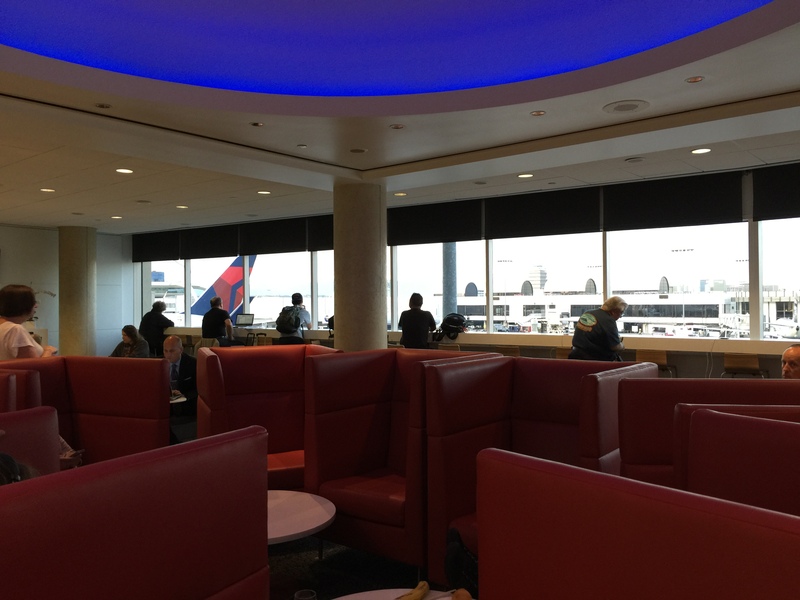 The Delta SkyClub at LAX, while spacious and beautifully designed, was really more of a lounge to sit and relax in prior to boarding a flight rather than a snack bar to grab food. Yes, there was a fully stocked bard, and there were some finger foods, but it definitely isn’t worthy of a meal, or really anything to write home about. Finger foods are really only enough to tide you over for a little bit until you can get to a real meal. And as crowded and busy as the Delta SkyClub is here at LAX, I’m not even sure really how relaxing the place is. Ok, probably more relaxing than sitting at the gate, and of course, while you’re at the lounge, you have free Wi-Fi and plenty of electrical outlets for your multitude of laptops, telephones and tablets, but really that’s about it. Will I visit the lounge again? Sure, and I actually have been there again since visiting it for this trip to New York, but at the same time, if I had to skip it because I didn’t have enough time at the airport, I wouldn’t be too heartbroken. It’s not much to write home about.